On Wednesday, Jay Gonzalez (left) celebrated winning the Democratic nomination to challenge Governor Charlie Baker. 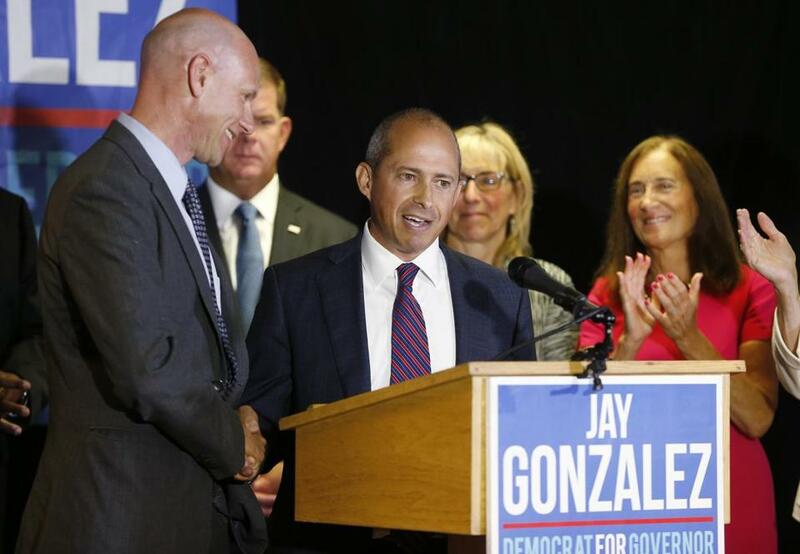 Taking to the stage at Wednesday’s Democratic Party “unity” rally, Jay Gonzalez, the gubernatorial nominee, said that an anti-incumbency wave was sweeping the Bay State, like the nation at large, and it would help sweep him right past Governor Charlie Baker in November. “When regular people engage in the electoral process to make their voices heard, they can make a very powerful statement. And you know what I’m talking about, right, Ayanna?” he said, looking over his shoulder where City Councilor Ayanna Pressley, who upset longtime Representative Michael E. Capuano this week, had been standing earlier. “Where’d she go?” he asked. It turns out Pressley, worn down by the primary’s final days, was battling what her campaign called symptoms of dehydration and exhaustion. But the awkward moment was a reminder that there’s no guarantee that the enthusiasm that boosted her, and other Democrats, to groundshaking victories Tuesday will extend to Gonzalez, the former insurance executive and state budget chief who topped environmentalist Bob Massie for the nomination. So began the gubernatorial general election, where Gonzalez is vying to knock off a popular Republican who’s enjoying the benefits of incumbency and a large campaign bank account, while employing a pitch built on bipartisanship. A few hours after the Democratic Party event, Baker held court in the South End for his own event, where he introduced Jack Connors, the retired advertising executive, philanthropist, and — as Connors made sure to note — a registered Democrat, as Baker’s campaign chairman. “I had the opportunity to vote in the Democratic primary yesterday and I didn’t put anybody in for governor of the two candidates because I already had my candidate,” said Conners, who also helped raise funds for Baker during his 2014 gubernatorial campaign. Baker, who easily held off a far-right challenge from Springfield pastor Scott Lively in his own primary, also debuted a new TV ad on Wednesday, another cheery spot touting the state’s booming economy and high graduation rates. And when asked specifically about Gonzalez’s criticisms that the state should “aim higher,” he responded by pointing out the administration’s procurement of two of New England’s biggest energy projects. Eager to keep the focus on his work, Baker still took a swipe at his Democratic opponent, questioning Gonzalez’s calls to move the state toward a single-payer health care system when asked if it was workable at the state level. “I look forward to him explaining how he plans to operate it and how he plans to pay for it,” Baker said. But despite what polls show to be an uphill battle to victory, Gonzalez and other state Democrats are going to try. Senator Elizabeth Warren, a hugely popular figure among progressive activists, will campaign for Gonzalez, starting with a rally being planned to occur soon. Gonzalez’s strategy, in part, seems to try to capitalize on the widespread anger against President Trump. Baker has criticized the president at times, including over what he called Trump’s “disgraceful” remarks at a summit with Russian President Vladimir Putin. But, Gonzalez and other Democrats contend, the governor doesn’t always aggressively challenge Trump, either. “The national context obviously is important. I think it makes it more important that we’ve got a governor that is vocally and aggressively standing up for people across this state and aggressively countering Donald Trump’s assault on basic protections and civil rights,” Gonzalez told reporters. Gonzalez also challenged Baker to sign an agreement to reject money from third-party political groups, along the lines of the “people’s pledge” that Warren made with Scott Brown in their 2012 Senate race. But Baker — who has already benefitted from two television ads paid for by a Republican Governors Association-backed super PAC — indicated he has no plans to sign. “Obviously everybody is going to play by the rules, and do everything that the OCPF requires us to do,” Baker said, using the acronym for the state’s Office of Campaign and Political Finance. Reach Matt Stout at matt.stout@globe.com. Reach Victoria McGrane at victoria.mcgrane@globe.com.